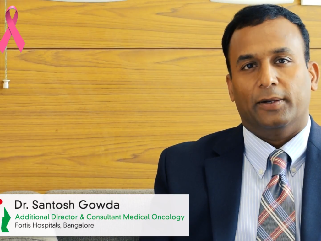 Dr. Santosh Gowda is a U.S. trained Hematologist / Oncologist and brings expertise with 4 American Board Certifications in Medical Oncology, Hematology, Internal Medicine, Palliative Care and Hospice. He worked as a Consultant Medical Oncologist / Hematologist and Director of Hospice and Palliative care for Duke University affiliated Hospital in U.S.A until April 2014. 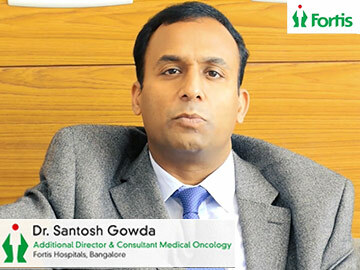 He also holds a Masters in Medical Science, Molecular Genetics and Microbiology from University of Florida, U.S.A. After relocating to India Dr. Santosh Gowda was spearheading Medical Oncology & Integrative Oncology at Mazumdar Shaw Cancer Centre for past 3 years and now has joined us at Fortis Hospitals, Bannerghatta road. 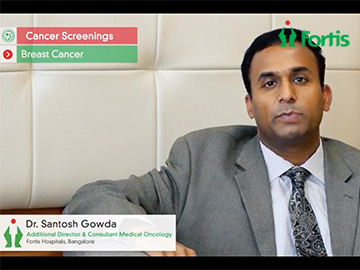 Preventive Oncology, Personalized Medicine, Immunotherapy, Integrative Oncology and Quality Initiative, Breast Cancer, GI, Head & Neck, Neuro Oncology, Lung Cancer, Kidney Cancer, Bladder Cancer, Prostate Cancer, Lymphoma and other Solid Tumours, Survivorship Care.